The DIYing has finally commenced. 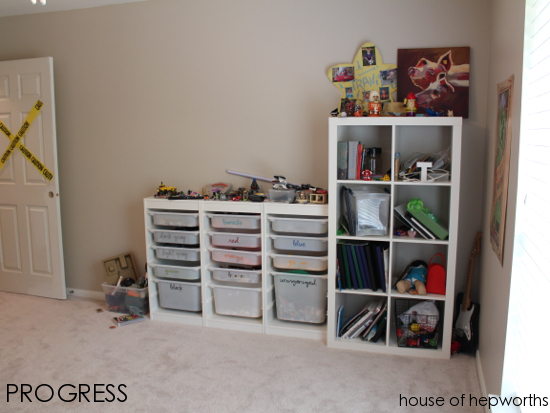 I have purchased the paint and the boy’s room is done-zoe. The rest of the house? NotSoMuch. But at least one room is looking really fly now. Okay, so I knew I wanted a greige color (gray-ish beige-ish) but which one? Picking paint is hard, y’all! First off, you have to decide what brand to use. That in itself can make one go completely cray-cray. And then the color? OMG forgetaboutit. Here’s the method to my paint picking madness. 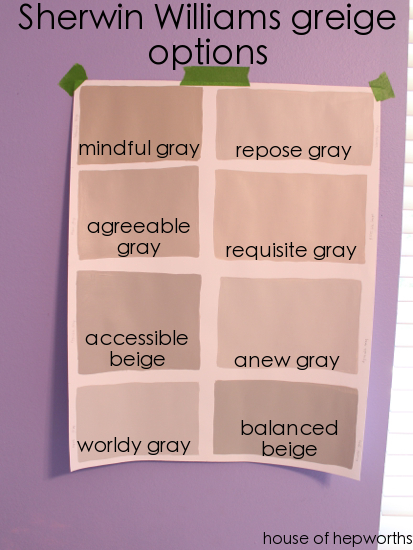 Maybe some of these motions I went through will help you out when trying to chose the perfect gray-ish beige-ish. What brand? Well, I have tried so many brands of paint, and they all have their place. I decided on Sherwin Williams paint. (I am not affiliated.) I chose them because I really like their paint (like, a lot). Also, I used a variety of paint brands in my old house, and had problems trying to color-match paints when I needed another gallon. Even if the color is spot-on, when you color match to a different brand the sheen will never be a perfect match. (To answer the obvious question here, I color-matched because one brand I used was discontinued, another was sent to me by a vendor and I couldn’t find it in Austin, etc). So I decided in this house that I am just going to use Sherwin Williams exclusively. That way I will always get the exact color I want and the sheen will always be a perfect match. Makes things a whole lot easier. I own a Sherwin Williams paint chip deck (you can buy them from SW) so I just pulled out any grays that caught my eye. After I narrowed it down to about 20 colors I headed over to Pinterest. Most awesome resource ever! I just searched each color of paint and got pages of walls and homes that had used that color. In no time flat I had narrowed it down to 8 colors that I really liked. 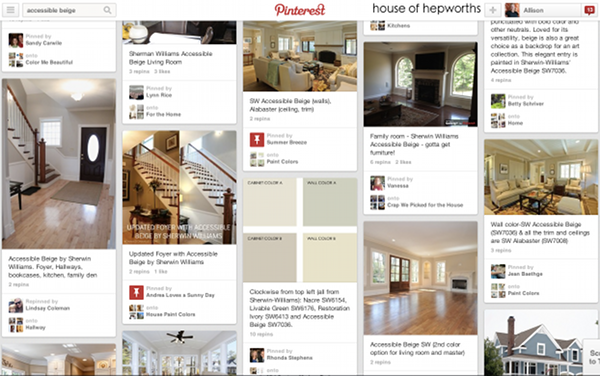 I pinned all my favorite rooms and colors onto my own pinterest board. Once I had my 8 colors selected I headed to Sherwin Williams and purchased 8 sample containers of paint – one in each color. I came home and painted each one onto a poster board and hung it on the wall. I moved it to several different rooms and looked at it in several different lights. After a few days I settled on Accessible Beige (third one down in the left column). And one more before. Try to overlook all the piles of crap everywhere. 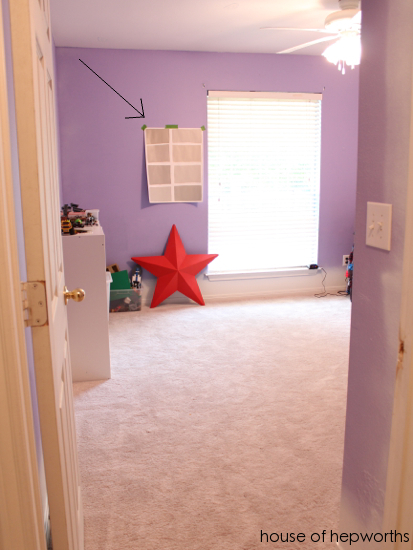 Okay, so I don’t know who lived in this room before my son, but whoever it was sure loved thumbtacks. I had to putty probably 500 little holes in the wall. Previous owner, step away from the tween boy band posters and put the thumb tacks down. Half finished… Already looking so much fresher. At this point I realized that there was lots of purple paint around the top edge of the wall and onto the ceiling so I took a break from the beige and painted the entire ceiling. I didn’t take any pictures of it but I used my always-go-to-white-color Alabaster in a flat finish. I got the paint and primer in one for the ceiling too. Side note: Satin on the walls, flat on the ceiling. And now, the “after”. Or rather, the “progress”. The room still needs a lot more decorating, but at least I have nice clean neutral walls now. Sometimes when I’m feeling overwhelmed in this house because of all the wild paint colors going on, I will just go stand in my son’s room and stare at the walls. It’s the only room in the house that looks brand new and pretty. And don’t you just love the X Do Not Enter tape on the door? That’s my son’s contribution to the room. Gotta love tween boys. 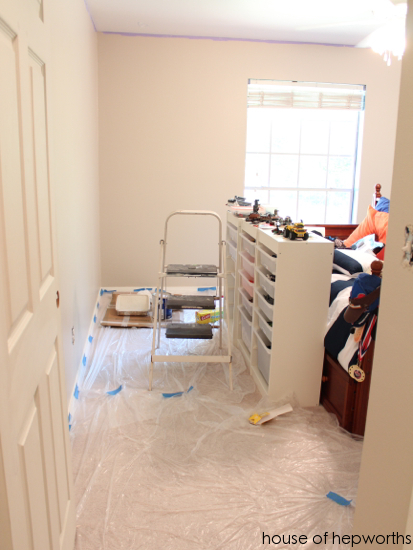 Here’s a shot of the freshly painted door and baseboards and the freshly painted walls. If you look across all the pictures the Accessible Beige looks a little different in each one. I love this color! It looks really beige in some light, but other times it looks gray. Exactly what I wanted. That’s the method to the paint selection madness. I have the paint to paint my daughter’s room (same color) but I haven’t had a spare second since school let out. And all this time I thought I would have more time come summer. Ha! The paint looks great! 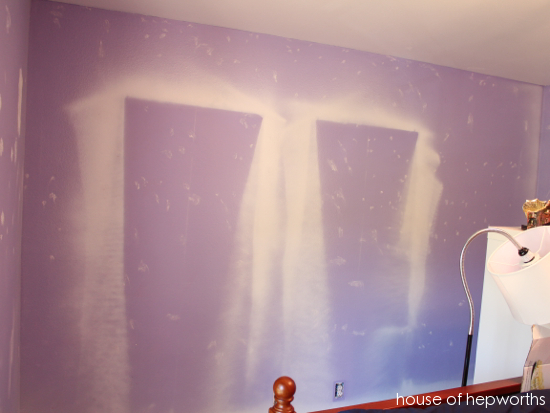 I bet your son is enjoying not having purple walls. 🙂 Good luck getting the rest of the house painted. Looks great!! I have been buying Valspar for all my paint needs lately but even getting the signature it takes more coats than I would prefer. We covered a hot pink wall a dark turquoise color. We used one or two coats of tinted kilz then three coats off the turquoise. 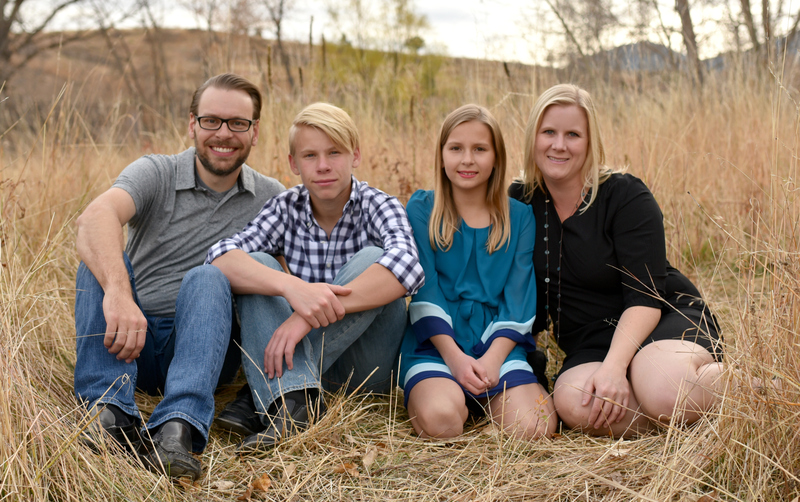 It took so much more than I had hoped for. How many coats did the Sherwin Wiliams take? How much does it cost per gallon? Maybe I need to reconsider with my next paint project. Last year money was very tight and we went with Valspar. Promises of “one coat” coverage were great for advertising…but nowhere near realistic. Two certainly. Three and touching up was more honest. (And that is after priming!) I had used Sherwin Williams before and never had this problem. Washability is also an issue. The paint just hasn’t held up. This year, money is less tight. Time is tighter. I’m going back to SW for my paint projects. I figure it is cheaper to pay more for the paint, use less paint, and be able to wash it for a few years. Not to mention the time saved with fewer coats. No, I am not affiliated with SW. I didn’t receive any compensation for my SW endorsement. (Although I’d love a few gallons of free paint!) Watch and wait for their sales. That new color looks so much nicer! Oooooo, NICE job! I studied your paint choices and decided which one I would chose before I scrolled down to see what you chose. Bingo! I chose the same as you! This was supposed to be a game, right? I love the color and the room. You do such gorgeous work. It looks GREAT! I’m sure your son is pleased too. Looking forward to seeing the transformations. Wow! That looks so much better. I love that paint color! 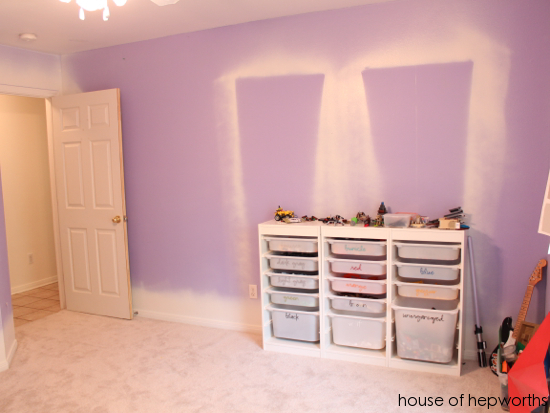 I’m sure your son is happy to be rid of the purple walls too! 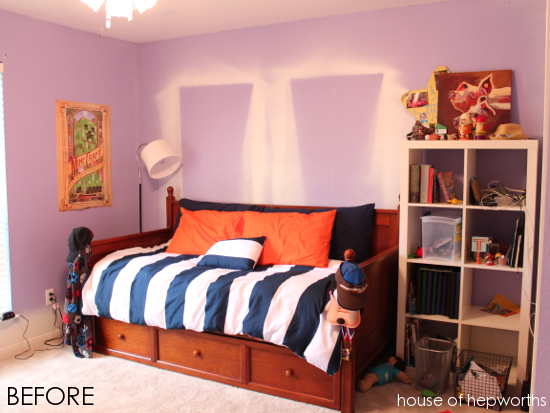 Amazing how paint can change the whole mood of a room. Great colors …I need to seriously get in motion and do some painting. Greige and me, we are sworn enemies. 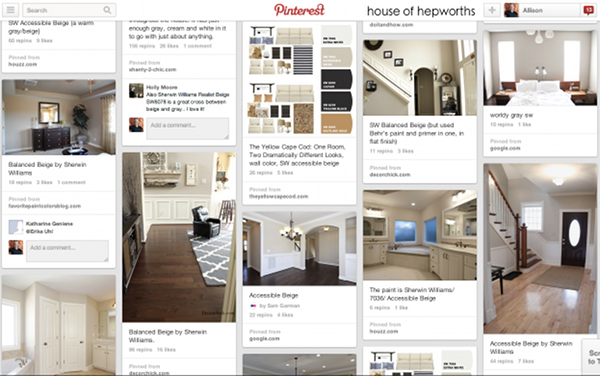 Perhaps cause I live in the Pac Northwest, plenty of greige in the air.And I LOVE Benjamin Moore. And one coat of paint is all that is needed is an Urban Myth. Other than that we see eye to eye, new paint is the best cure for what ails ya!! The room looks great, I am so looking forward to hearing and seeing about your new adventures. Hey, congrats on the new house! 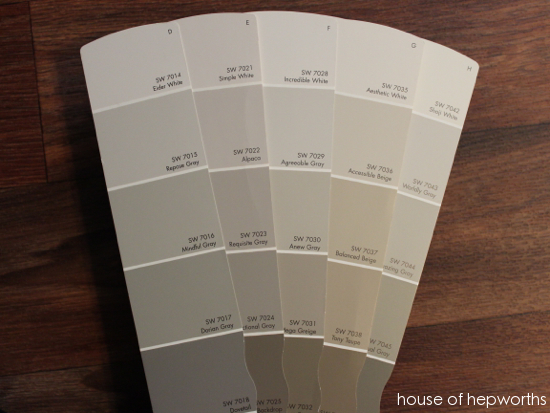 Your chosen greige is perfect … I would be constantly at the door admiring how fantastic it looks. Love the color! 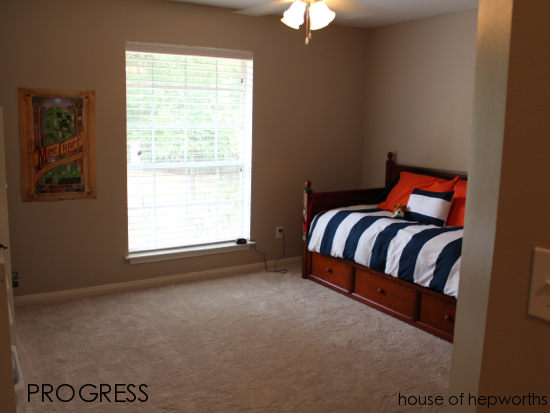 I’m in the process of painting our master bath a darker greige and it’s so refreshing! Also I always use satin finish on my walls too! It makes them WAY easier to clean and not scuff! That purple really threw me off in these pics. I thought the color you chose would be dark, and here I see in the after how much lighter it really is. Just goes to show ya, you never know until the paint is on the wall. Nicely done! The colors look fantastic! I was thinking about using that same color on my child’s room as well. I am sure your son is happy as well. I know mine would be! Great choice of color! I am sure your son would be over the moon that the purple is gone as well. 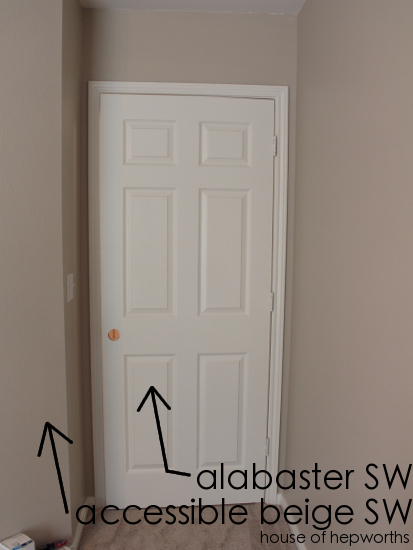 I am a colors on my wall kind of girl but I definitely appreciate the job you’ve done and the recommendation of SW paint being worth the investment. Thank you! If you are worried about using flat paint because of the non-washable nature of the finish, try Sherwin Wms Duration paint. It is washable and flat. I have used this in several rooms and love it. It also goes on like silk. And no, I am not affiliated with SW in any way.